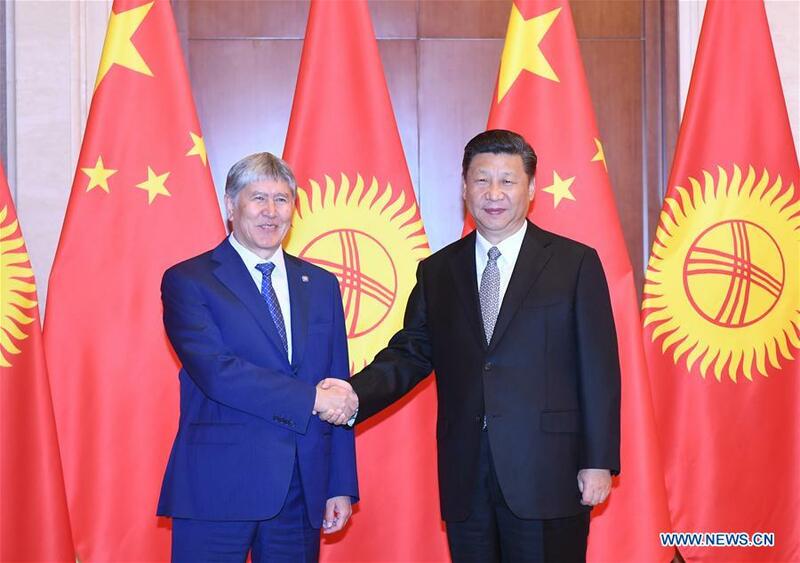 BEIJING, May 16 (Xinhua) -- President Xi Jinping met with his Kyrgyz counterpart Almazbek Atambayev in Beijing on Tuesday, vowing to push forward the two countries' strategic partnership. Since the establishment of diplomatic relations between China and Kyrgyzstan 25 years ago, both sides have advanced bilateral ties while upholding the principle of mutual respect and win-win cooperation, said Xi. The two countries have built a comprehensive cooperation pattern featuring strong mutual political trust, close economic cooperation, mutual reliance in security, mutual exchange and learning in culture, and mutual support in international affairs, said Xi. China is willing to work with Kyrgyzstan to promote the spirit of good-neighborliness and friendliness, enhance strategic coordination, deepen mutually beneficial cooperation and push forward the China- Kyrgyzstan strategic partnership, he added. China supports Kyrgyzstan's efforts to safeguard independence, sovereignty and territorial integrity, and supports its development path and domestic and foreign policies in accordance with its own national conditions, said Xi. As important forces in maintaining regional security and stability, China and Kyrgyzstan should enhance anti-terror and law enforcement cooperation, said Xi. Remarkable progress has been achieved since China and Kyrgyzstan carried out cooperation under the Belt and Road Initiative more than three years ago, said Xi, expressing the hope that the people of the two nations will benefit more from the initiative. Atambayev, who attended the Belt and Road Forum for International Cooperation held Sunday and Monday in the Chinese capital, congratulated China on the success of the event. The great Belt and Road Initiative will help strengthen international cooperation and mutual understanding and trust for all parties, said Atambayev. China is a good neighbor, a good partner and a good friend of Kyrgyzstan. The strategic partnership is developing on a high level, he said. Kyrgyzstan thanks China for its long-time support and help and will firmly back China's stance on issues regarding core interests and major concerns, said Atambayev. Kyrgyzstan is willing to strengthen cooperation with China in various fields such as the economy, trade and security, and actively advance the construction of key infrastructure projects, he added.